The King Air 350 is part of the Super King Air family (although the ‘Super’ was dropped from the name in 1996), which came to market in 1964 and comprises of the 90, 100, 200 and 300 series. Originally produced by Beechcraft, the King Air brand now comes under the Textron Aviation umbrella, which also includes Cessna. The 350 began its manufacture in 1990 and was a successor to the King Air 300. It was followed by the 350C, the 350ER and the 350i. Planning on buying a King Air 350? Read its specifications below. 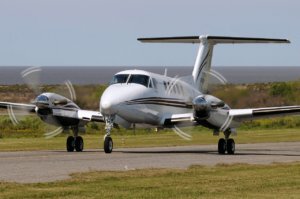 The King Air 350 stands at 14.4ft high, 46.8ft long and has a wingspan of 57.11ft. The King Air range is known for being robust and the wing on the 350 actually has whole-life certification. The cabin is large for a plane of this size, with a height of 4.10ft, a width of 4.6ft and a length of 19.2ft. Its fourteen oval windows provide plenty of light and the positioning of the propellers and the engines, together with the anti-noise system, reduce the vibration and noise that reaches the interior. The King Air 350 is configured for eight passengers with moveable, reclining seats and work tables but you can also choose a six seat layout or increase to a maximum of 11. There’s an internal baggage capacity of 71 cubic feet, which includes a netted baggage hold of 55 cubic feet. It has two turboprop Pratt & Whitney PT6A-60A engines. Its normal range is 1,440nm with a maximum range of 1,550nm, and it has a normal cruise speed of 312ktas, a maximum cruise speed of 320ktas and a long range cruise speed of 235ktas. Its service ceiling is 35,000ft. The cockpit has the Rockwell Collins ProLine 21 installed and WiFi and a satphone are available in the cabin. Want to sell your King Air 350?